Is your home in Bernalillo, New Mexico, or a surrounding area, in need of new soffit and fascia? If so, turn to the professionals at ABC Seamless of Albuquerque. We have proudly served the area since 1989 and in that time we have built a reputation for providing for high-quality, exterior, home improvement products. 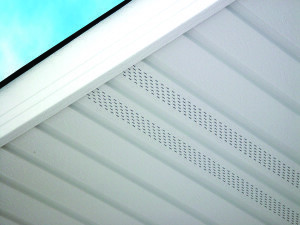 The soffit we offer is beloved throughout the industry thanks to its incredible durability. While most soffit systems will come off easily due to their staple applied nature, ours will remain attached for years to come because it is applied with screws. And, our fascia makes an impact on all of our clients thanks to the wide variety of colors and styles it is available in. In fact, you will be able to easily match your home’s existing exterior to a new soffit and fascia installation because we offer them in the same colors as our seamless siding. At ABC Seamless of Albuquerque, we stand by all of the seamless steel products we offer by providing you with an industry-leading lifetime, transferrable warranty that covers labor and materials. And, by only utilizing factory-trained and -certified installers you can feel confident that your installation will be completely correctly the first time. To learn more about the beautiful seamless siding and soffit and fascia products we offer to homeowners in Bernalillo, NM, and the surrounding communities, contact ABC Seamless of Albuquerque today.